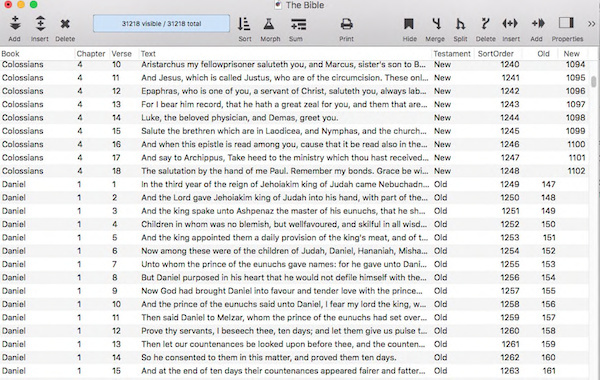 Some years ago a fellow Panorama user supplied me with a raw data set containing the King James Version (KJV) of the Bible and asked me to get it organized in a Panorama database. I recently ran across this database and thought that since it is an often quoted historical document it might make a handy Panorama resource database. 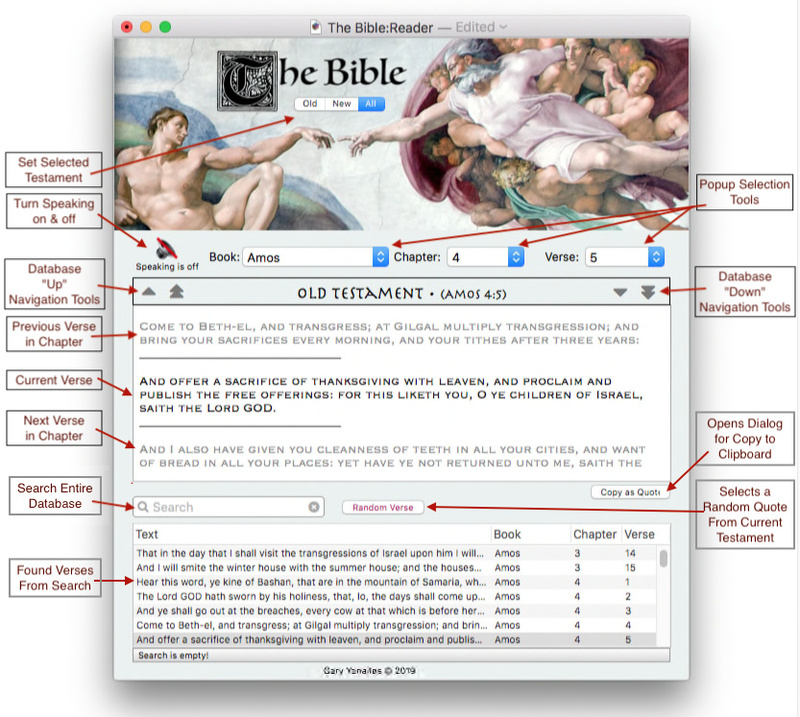 I took the basic 31K+ biblical verses and added a user interface so that it can be searched and copied. All the data is listed and sorted by Book, Chapter and Verse. There are also designations as to the New or Old Testament along with additional fields that have the default sort order in case the record order is ever jumbled by mistake. I tried to include as much as possible on this form and yet keep it simple. You may notice the Speaking option that I include even though I find it rather disconcerting to have a soulless, robotic computer voice reciting scripture. You are free to add or remove anything you want and adapt things as you wish. I included options in the dialog so you can copy more than just a single verse with the ability to copy a sequence of verses as well. 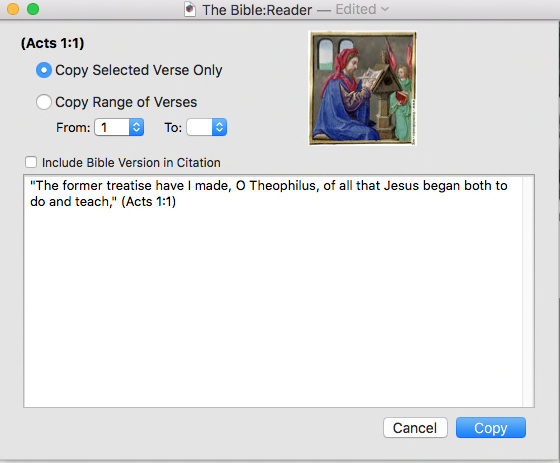 You can chose to have the Bible Version appended to the citation if desired. This file is offered as is for those who may find it of value. Yet another amazing resource from Gary. I suspect there might be more downloaders than you think. Do you have a counter on it? I suspect there might be more downloaders than you think. Do you have a counter on it? First of all, thanks for the kind words…always nice to get positive feedback. Whenever there is a download link on a forum post you can see how many have been downloaded by checking the little circled number at the end. In this case there have been 3 downloads. Just happy that a few folks found it worth the effort to grab it. I found one small bug. The ‘x’ button on the right end of the search box refers to the wrong variable (_liveSearch instead of theSearch). Oops!, I guess I forgot to change the default variable to the one I was using. I never clicked the X in my tests and I guess that is why you use beta testers. There are a couple of other minor bugs which I’ll get around to sending to you when I’ve finished testing. Also some suggested modifications if you don’t mind. I find it a very interesting app, even though I’m not a Bible reader. I’ll be happy to take a look at what you have to offer and see if it is something I want to continue pursuing. I’ve made Tom’s correction but will await uploading a new version until I hear what you come up with. In case anyone noticed that the various Popup Menu Buttons (Book, Chapter & Verse) are not really what they seem because I have them as non-functioning backdrops with Text Display Objects sitting on top that run a popupclick menu when clicked. I found that often the Popup Menu Buttons would simply go blank when the selected variable value was changed via a procedure. Showvariable nor showpage would update the screen even though the variable had the proper current value. Only manually clicking the button itself would redraw them properly or changing them several more times procedurally would all of a sudden have them reappear properly. Using the Text Display Object together with the popupclick worked reliably and seemed the best solution in this case.